The Civil War inspired the famous poem, "Barbara Frietchie," but with slavery abolished in 1865 Whittier turned his attention to topics of religion, nature, and rural life. His most popular work, Snow-Bound (1866) sold 20,000 copies, enough to leave Whittier and his extended family without financial need. In the early 1880s, he formed close friendships with Sarah Orne Jewett (1849–1909) and Annie Fields (1834-1915), both well-known New England authors. For his seventieth birthday dinner in 1877, Ralph Waldo Emerson, Henry Wadsworth Longfellow, Mark Twain, Oliver Wendell Holmes, James Russell Lowell, and William Dean Howells were in attendance. While Whittier's critics often considered him to be just an average poet, they thought him a noble and kind man whose verse gave unique expression to ideas they valued. 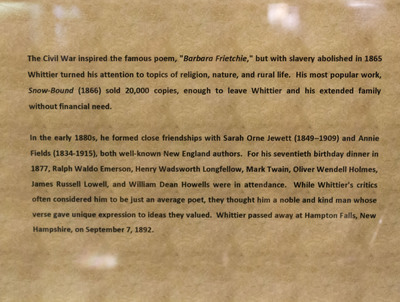 Whittier passed away at Hampton Falls, New Hampshire, on September 7, 1892.